Aluminum fencing makes a great addition to any property in the Franklin area! Aluminum fence is beautiful, versatile and long-lasting. Care and maintenance of aluminum fencing is minimal, making it a great choice for many homeowners today. Aluminum fencing is an excellent choice for fencing for pools, yards and businesses too. We offer a variety of aluminum fence styles. Franklin TN Fence is the leading fence contractor for aluminum fence installation in the Franklin area. 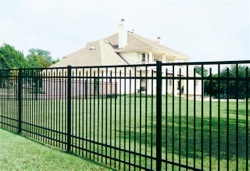 We have many years of experience in designing and installing aluminum fencing for many residents in the Franklin area. You can trust the talented Franklin fence professionals to install your aluminum fence just as your envisioned it. Our goal is total customer satisfaction with each and every fence install that we do. Our team will design and install the perfect privacy fence just for you! Click here to view our Aluminum Fence gallery.